In a recent SCMP I picked up the article above under the letters to the editor section. Although you would not associate Hong Kong with reefs like Indonesia, Philippines and Malaysia that doesn't mean there is nothing to see. Often the first comments about diving in Hong Kong waters are like - nothing to see, cold, where? Hong Kong waters are on the top side of tropical reefs, and therefore you will still be able to see hints of coral reefs. As the water temperature varies between 30c in summertime to 16c or so in wintertime, a good number of corals have difficulties growing. Though, a staggering 84 species of corals can be found (Out of 800 worldwide)! Not bad.. given the fact that the salt levels change a lot, due to typhoons and other activities the turbidity can be quite high and there are big temperature fluctuations. All things not in favor of coral growth. A 2011 ReefCheck shows some positive developments of the conditions of Hong Kong its reefs. Minor bleaching, and no real damage through dynamite and other destructive fishing. Some damage was caused by abandoned and lost fishing nets and other garbage. The sites that do have an abundance of corals are a pleasure to dive, as this also means an increase in fish-life. There are many dive operators using the waters for training ground. Fortunately avoiding the really sensitive areas. Though with proper training and therefore good buoyancy control, those sites should be paid a visit. It would send a good signal to people that there is life in Hong Kong waters. This hopefully would also slow down the crab, lobster hunting as well as spearfishing on too small fish. In the summer of 2011 there was some good excitement about a sting ray spotted in Little Palm Beach. The excitement got tempered when the stingray was spotted in a bag, after being shot by a speargun. Anyway, where are those areas? They mainly grow along the northeast and eastern shores where the waters are both sheltered (from storms and thus waves) and free from the influence of Pearl River (fresh water, sand etc). To be a little more specific, places like Tung Ping Chau, Kat O, Shelter Island, Chek Chau and Hoi Ha Wan are host to colonies. In the eastern region, likes Sharp Island, Shelter Island, Bluff Island and along the Sai Kung Peninsula smaller colonies can be found. 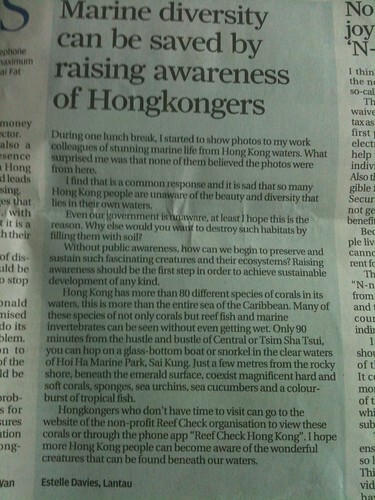 Want to see more about Reefs in Hong Kong? There is a lot of media available, from books to iPhone apps. The ReefCheck App can be found through here. 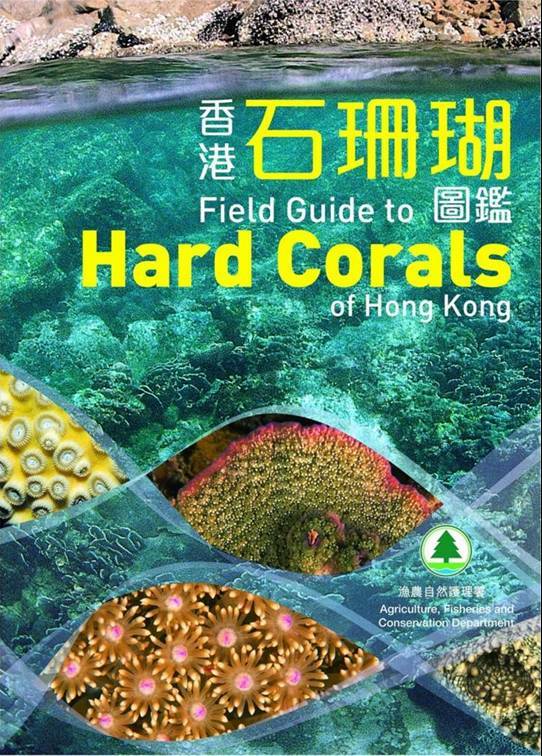 Interesting reads are "Hong Kong Reef Building Corals", a must have for any local diver. It provides some good background information on what corals are, their importance, how they grow and..where they can be found. A more detailed one is "A Field Guide to Hard Corals of Hong Kong", an indepth write up of hard corals that can be found in the area.